What can you do with a shoe? You can put it on your ear or wear it on your head or butter it like bread or use apple jam instead! What can you do with a hat? You can fill it up with pickles or with popcorn or with glue. An octopus could rest in it, a bird could build a nest in it, a turtle be a guest in it. Or would a horse look best in it? These are samples of the questions and wonderfully silly, laugh-provoking answers in a game played by a little girl and boy dressed up i their parents clothes. On every page of this whimsically playful book, there are enchanting watercolor illustrations by Maurice Sendak. Inspired by the infectiously funny pictures and text, children will soon begin to make rhymes of their own about everyday things. 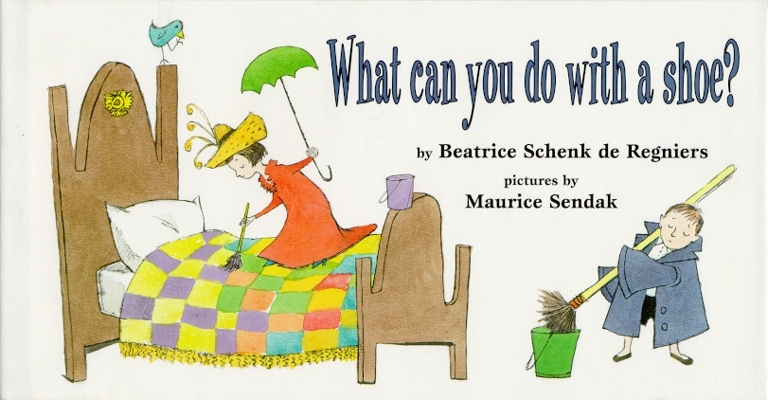 Richly imaginative and wholly in tune with children's high spirits and sense of play, What can you do with a show?, now issued in a new edition with full-color paintings, will be welcomed by young and old. It is a treasure. Book Cover Image (jpg): What Can You Do with a Shoe?